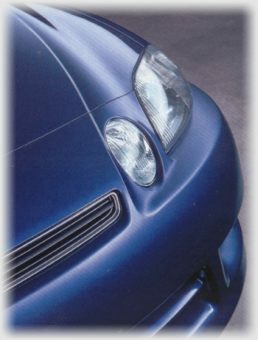 OK then, if you've arrived here wanting to know more about the Soarer or the LSOC then this is the page where you'll find the info that you need, well at least the basics. If you search the site using the search facility above, you'll see that there's far more to learn. Firstly, a short paragraph about the LSOC, which - as you've probably realised by now - stands for the Lexus Soarer Owners Club. We are a UK based resource dedicated to providing help and information to Soarer owners. The club was formed in August 1999 and at its height had a membership of over 4000 people. We have a vast library of information about the car and a forum where owners and potential owners can meet and discuss Soarer related matters. OK so now on to what many once described as the king of import cars. Certainly in terms of the Japanese import market anyway. Already we have an identity issue (which may have been caused partly by the name of this club). 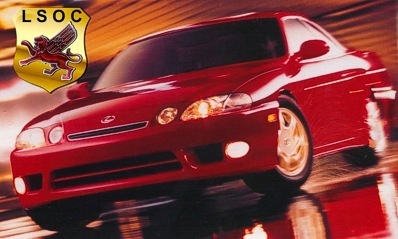 There is no such thing as a Lexus Soarer. The MKIII Soarer is now out of production, but was originally marketed from 1991-2000 in Japan and also in the USA as a Lexus Coupe. It was not sold in Europe. It was actually designed in Calfornia by an American company. It is still considered by many to be the best looking car ever to have carried the Lexus badge. In Japan it was called a Toyota Soarer (they did not use the 'Lexus' branding at all in Japan at that time). There were 5 Japanese Soarer models, all right hand drive, and any of these cars that you might have seen (assuming you are in the UK or Australia) will almost certainly have been a Japanese Soarer. After importation some people leave the Toyota logo and griffin (Soarer) emblem as they found it, others (most people in fact), replace the badges with 'Lexus' ones, to mirror the western branding that was used on the US models. Hence there have been a considerable number of "Lexus" Soarers around for some time. It's an interesting fact that a large number of the MkIII Soarers (probably the majority) no longer reside in their homeland. Used cars in Japan have a limited shelf life. Whilst the Soarer was incredibly popular and much sought after when it was launched, the fascination was to last for around two years before newer technology came along to replace it. And although the production line continued until the turn of the century, the top of the range V8 models ceased to be of interest to the technology hungry Japanese and were discontinued in early 1997, even though they were probably still well ahead of their western counterparts. Production of the V8 continued however for the American market right up to the end. Most of the MkIII models ended up residing in the UK or Australia. There are still some low mileage, well maintained Soarers to be found. Indeed it's worth paying a few bob more if you do come across one with an impressive service history. Mileage is not really an issue because the superior Lexus/Toyota build quality has meant that there are Soarers around with over 250,000 miles on the clock (in the USA there are reports of over 1,000,000 miles) so six figure odo readings are not necessarily an issue. However there are some poorly maintained examples around these days, and with many parts now out of production, caution is advised before considering purchasing a Soarer if you see one for sale. If you want to know more about the individual models please read on below. All of the models look physically the same from the exterior. The only diversity is that some have a rear spoiler, some don't. All Japanese Soarers have a digital dashboard display. Some of the V8 models come with televisions and built in Global Positioning Systems (GPS). Unfortunately the TV will not work in the UK without an expensive conversion (NTSC to PAL), which costs around £500 and requires the fitting of an external aerial. The GPS cannot be converted to work outside of Japan at all. The TV monitor can still be used for controlling the air conditioning system and stereo, as most of the necessary screen functions are in English. It will also operate in conjunction with the reversing camera, if the car has one fitted, and can be converted quite easily and cheaply to play DVD's too (we have a tutorial here on the site for that). By far the rarest of all of the Soarer models is the V8 with active suspension. This car was a triumph in automotive design, incorporating four wheel steering and traction control. For many years it was the only active suspension vehicle that actually worked. It was also quite an expensive option in it's native Japan, and there were only 880 of them made. The MkIII Toyota Soarer/Lexus Coupe certainly made it's mark on the world. The amount of cars in the USA that resemble it is quite staggering. And it's been long rumoured that it had more than a little influence in the shaping of the Jaguar XK8. Finally a little more about the phrase "Lexus Soarer". In August 2005 Toyota launched the Lexus brand on their own territory (interesting since the word LEXUS apparently stands for Luxury EXport to the United States). One the first vehicles from their fleet to be re-branded was, you've guessed it, the Soarer. The Toyota Soarer is no more. It is now known throughout the world as a Lexus SC430.